Check out Tobi's Whitney Bell Sleeve Shift Dress How Stella got her groove back in the Olive Whitney Bell Sleeve Shift Dress. A loose, long sleeve dress featuring a single deep v strap detail and trendy bell sleeves. Add to its 70's cool girl vibe with statement chandelier earrings and wedges because tbh, we want this in every color—the khaki dress in particular. How Stella got her groove back in the Black Whitney Bell Sleeve Shift Dress. 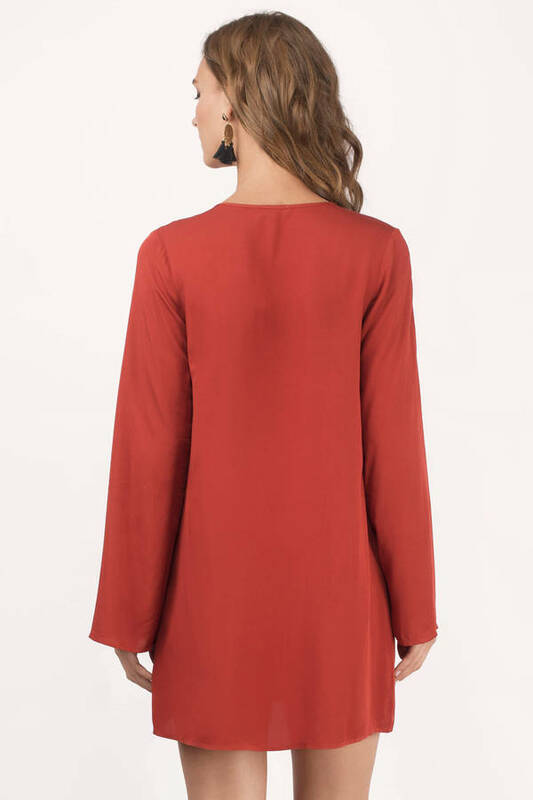 A loose, long sleeve dress featuring a single deep v strap detail and trendy bell sleeves. Add to its 70's cool girl vibe with statement chandelier earrings and wedges because tbh, we want this in every color—the khaki dress in particular. How Stella got her groove back in the Olive Whitney Bell Sleeve Shift Dress. 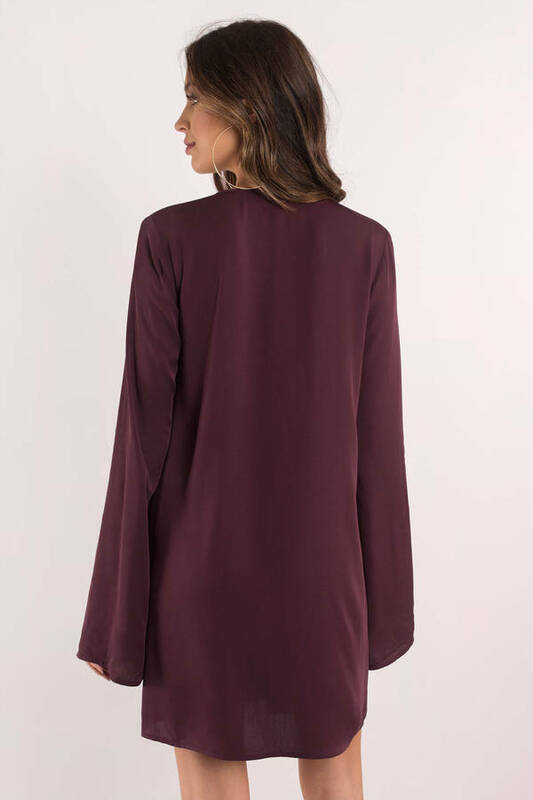 A loose, long sleeve dress featuring a single deep v strap detail and trendy bell sleeves. Add to its 70's cool girl vibe with statement chandelier earrings and wedges because tbh, we want this in every color—the khaki dress in particular. How Stella got her groove back in the Rust Whitney Bell Sleeve Shift Dress. A loose, long sleeve dress featuring a single deep v strap detail and trendy bell sleeves. Add to its 70's cool girl vibe with statement chandelier earrings and wedges because tbh, we want this in every color—the khaki dress in particular. How Stella got her groove back in the Burgundy Whitney Bell Sleeve Shift Dress. A loose, long sleeve dress featuring a single deep v strap detail and trendy bell sleeves. Add to its 70's cool girl vibe with statement chandelier earrings and wedges because tbh, we want this in every color—the khaki dress in particular. Model's profile: height 5' 9.5", bust 32", waist 24"
Burgundy modeled on a size Small. Model's profile: height 5'9.5", bust 34", waist 23.5"